The intimate outdoor living area features concrete garden walls with integral planter boxes, a bench, and an 8-foot-tall concrete fireplace, all given a rough board-formed finish. A closer view of the garden walls and their board-formed finish. Some of the most stunning concrete projects we've seen on The Concrete Network have taken a “less is more” approach by embracing the beauty of natural concrete. This project is certainly no exception. 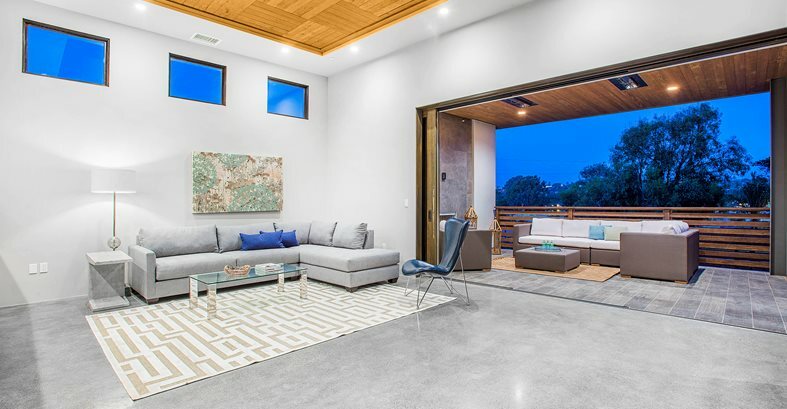 Located in the beach community of Luecadia, Calif., this newly built contemporary home features polished masonry interior walls and concrete floors throughout and an outdoor living space created with natural board-formed concrete. 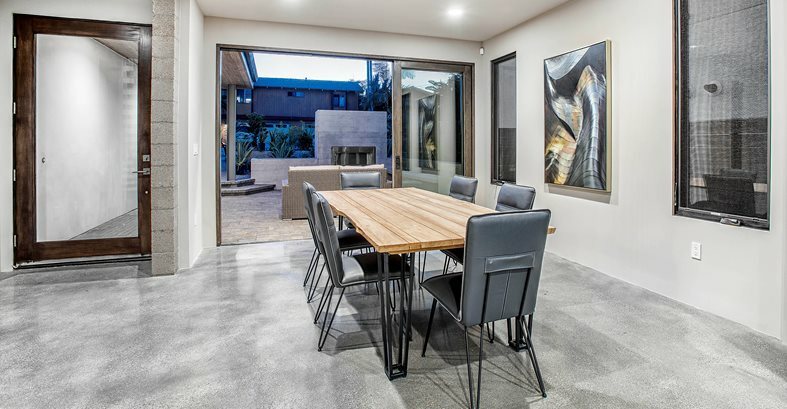 Disappearing door systems connect the home’s interior and outdoor living spaces, creating a seamless transition. Along with the concrete flooring, Zephyr decided to use unfinished concrete masonry walls to establish a luxurious, modern, industrial feel. “Zephyr wanted a finish that would be easily cleaned and wouldn't collect dust. Because the natural finish of the block walls was very porous and rough, we ground and honed the walls with hand-held grinders and polishers. Our initial cut was done with 50/60 metal-bond diamond abrasives followed by a 50- and 100-grit resin-bond diamond abrasives,” says Espinoza. After the honing process, the surface was left a natural gray and sealed with a water-based sealer. The beautiful, unadorned concrete flooring was chosen for its natural sheen and low maintenance. No integral color or stain was used. “We did a wet grind with 30/40 metal-bond diamond abrasives as our initial cut. We then followed with 60/80 metal bonds and 100 to 1500 resin-bond diamond abrasives, along with two applications of densifier/surface hardener. After the last pass of 1500 resins, we applied three coats of a stain-protectant sealer and then burnished the floor with a 3000-grit polishing pad,” Espinoza explains. 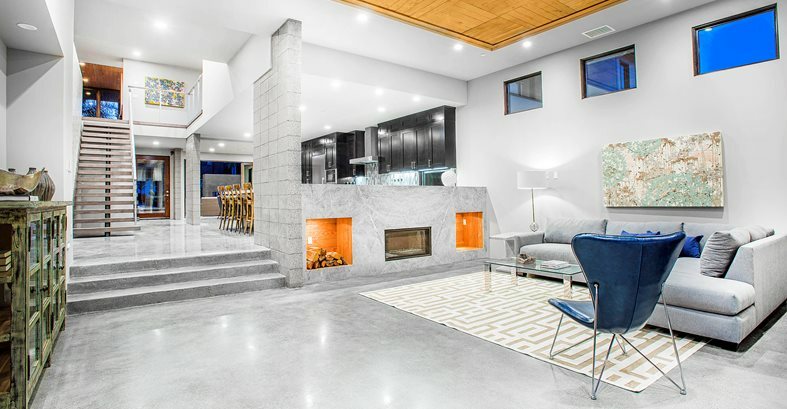 To produce the rough-sawn finish, Envision Concrete used CDX plywood forms and a natural gray concrete mix, but Espinoza admits that they encountered some problems with the planter and fireplace sections. “After stripping the forms three days later, some of the finish came off with the form panel. 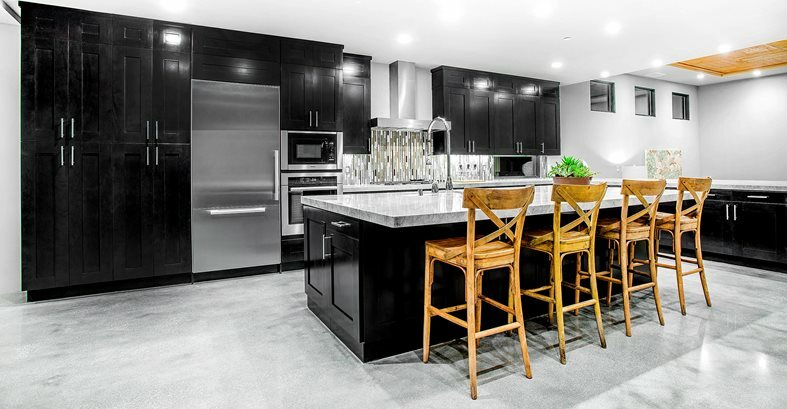 To remedy the situation, we used a stampable overlay mix and applied it vertically to the surface and then stamped it to match the existing board-formed finish,” he says.